Fry is un-frozen after 1,000 years. Leela gives Fry his career, who rejects it and flees. 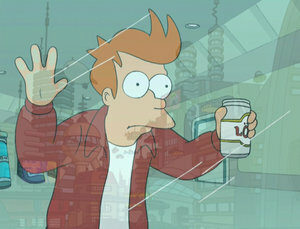 Fry tries to call his great, great, great... great nephew and meets Bender at a suicide booth. The two of them are pursued by Leela, who later has a change of heart and removes her own career chip. They are soon after hired at Planet Express, shortly after midnight on 1 January, 3000. This page was last edited on 17 April 2011, at 14:55.